Clarksville, TN – When Darlene Howell, coordinator of the Austin Peay State University Military Student Center, was called out of her office on Wednesday afternoon, she was a bit confused. Why were there so many people – including APSU President Tim Hall – gathered in the Center, watching her every move? 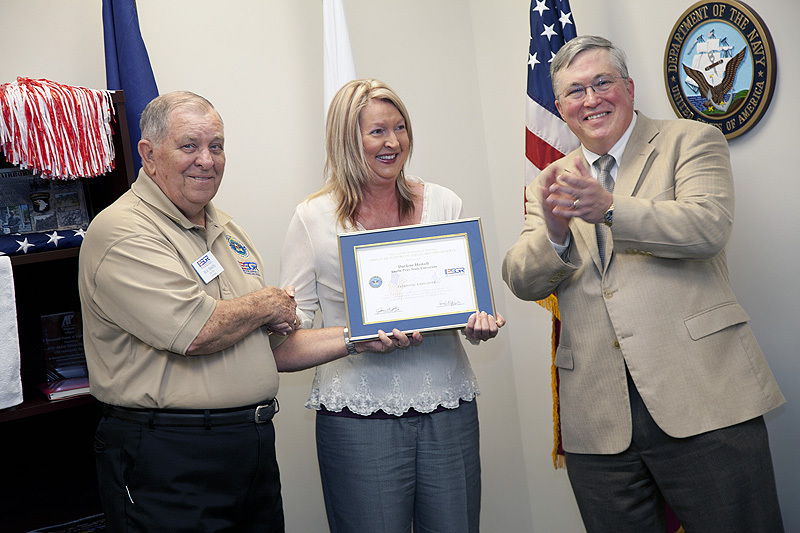 But then Bob Beaty, a volunteer with the Department of Defense’s Employer Support of the Guard and Reserve (ESGR), stepped forward to clear things up by presenting Howell with an award. Howell smiled bashfully as those gathered in the packed room applauded and cheered her recognition. Beaty presented her with a certificate, and President Hall handed her a Patriot lapel pin. “Darlene, we’re proud of you,” Hall said. The ESGR is a Department of Defense organization, established in 1972 to promote cooperation and understanding between Reserve component members and their civilian employers and to assist in the resolution of conflicts arising from an employee’s military commitment. For more information about ESGR, visit www.esgr.mil.